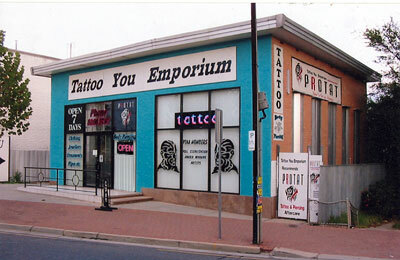 Established back in 1984, a few shops to the East, Tattoo You Emporium moved up the street to 304 North East Rd, Klemzig South Australia. Looking at it, it's hard to believe that the place used to be a bank. There's a great 'open plan' feel to the shop which lets in plenty of light and lends a relaxed atmosphere. Customers are made to feel welcome with no obligations and are encouraged to browse. We have a large range of clothing with something for everyone. If it's Aftermath clothing you're after we stock a great range of mens, ladies and kids wear. There's tops, leggings, dress shirts, singlets, beanies etc. ... we stock it all. We also have a range of Stardust Creations ladies wear. Then there's the Hot Rod and Street Wear stock with a huge range of Route 66 and Moon dog clothing available. If you're looking for that special outfit that's a little bit different from your standard department store stock, come on down to Tattoo You Emporium and try a few things on. Can't find the perfect present for that hard to buy for someone? Then you haven't been to Tattoo You Emporium. We stock a large range of "different" gift ideas. Aftermath wall hangings and bedspreads are always popular with a large range of colours and designs available. Or maybe Gargoyle bookends are what you're after, why not collect the whole set? We have hip-flasks, candle-holders, ornate mirrors, water-fountains, incense, Bico jewellery, posters and too much more to mention. So why not keep us in mind when shopping for gifts. We're not just a tattoo studio.